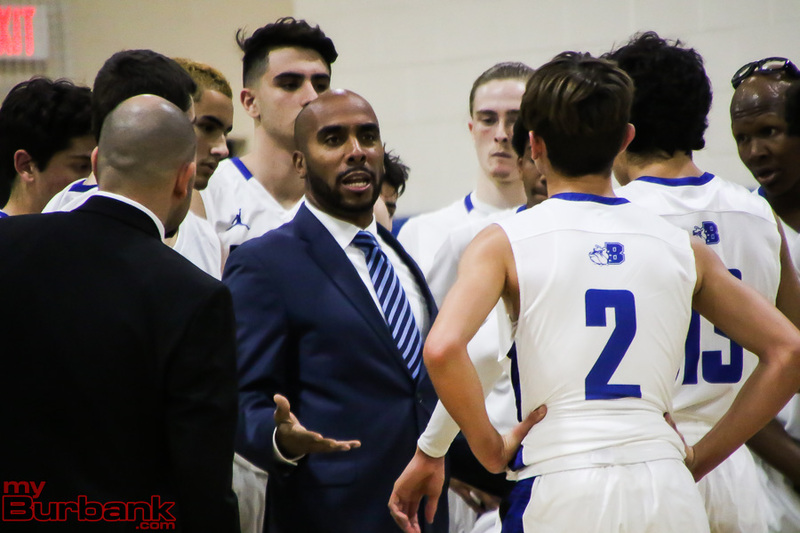 Getting to the CIF Southern Section playoffs for the Burbank High boys’ basketball team had to be somewhat of a surprise considering that Bulldogs coach Ernest Baskerville only became the coach just weeks before the season started and on the heels of a few key players transferring out of the school. 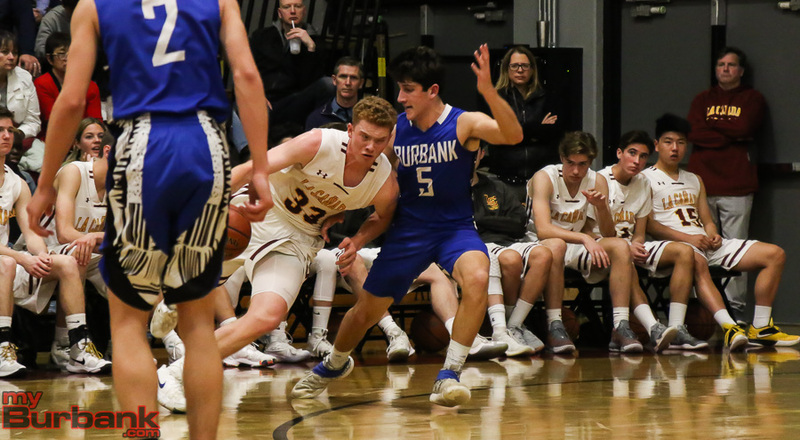 Burbank wasn’t fortunate enough to find a first-round playoff opponent that faced similar circumstances, as the Bulldogs traveled to La Canada High, which is coached by Tom Hofman. Hofman recently won his 700th game in his 33rd season as La Canada’s head coach. When it was all said and done, Hofman’s Spartans handed the Bulldogs a 57-43 defeat in a Division 2A first-round contest. 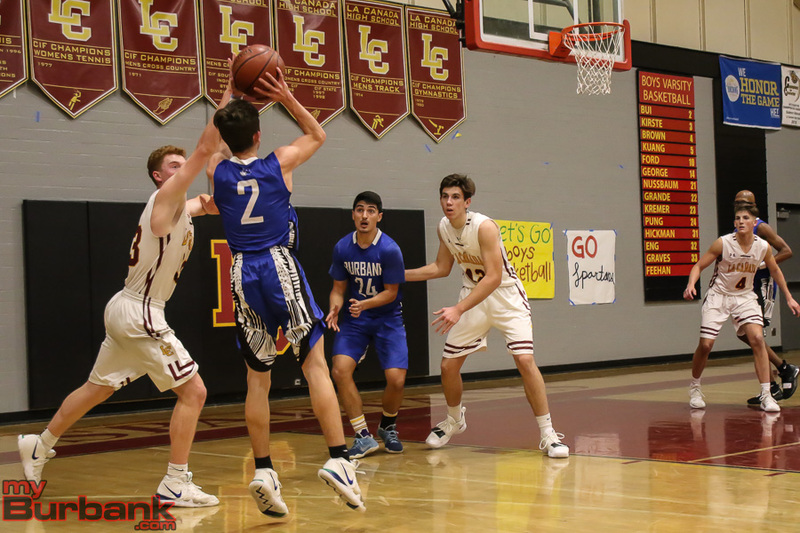 La Canada (24-5) held Burbank to 14 of 57 shooting for the contest, as it took the Bulldogs a while to get into a rhythm. 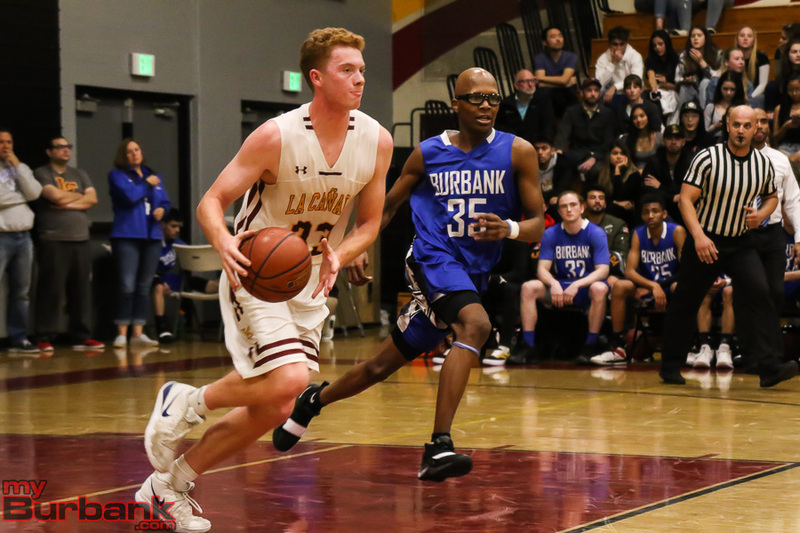 La Canada also didn’t make things easy on Burbank by playing solid defense. Burbank (17-12) scored just four points in the first quarter and trailed 10-4 going into the second quarter. 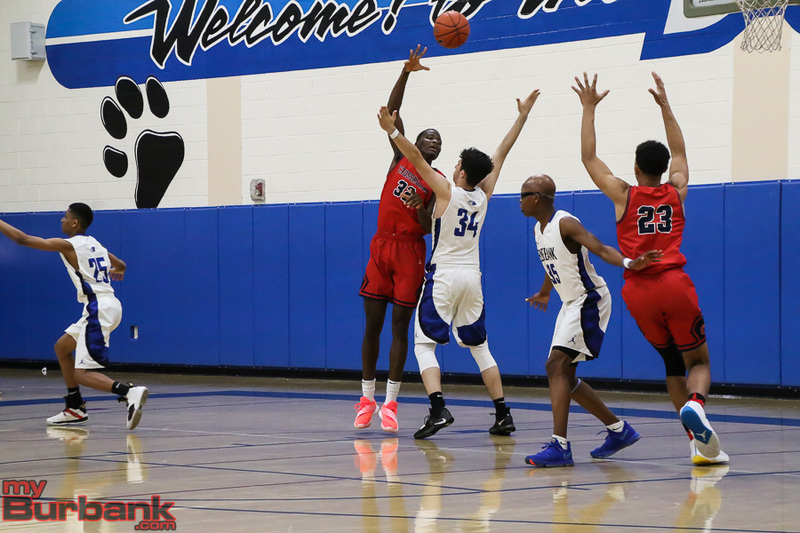 The Bulldogs trailed 20-6 midway through the second quarter when Isaac Anglade banked in a shot off the glass to get the offense moving. 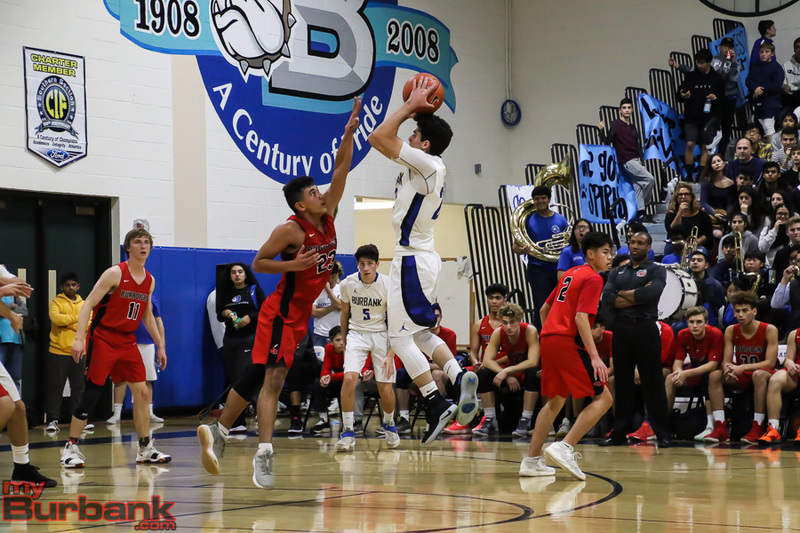 D’Agostin later hit a pair of three-point shots to help Burbank completely turn things around, as the Bulldogs trailed just 28-21 going into the halftime break. Things looked good early on in the third quarter when D’Agostin hit three consecutive free throws to cut the deficit to 30-24. 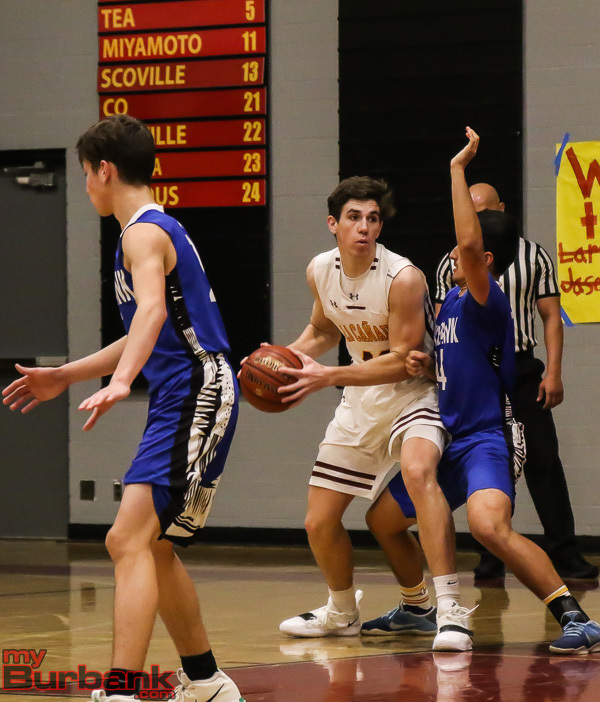 But La Canada roared right back and got a huge boost when Graves completed a three-point play with just .9 seconds left in the quarter, pushing the lead to 44-30. A pair of free throws by Erik Harutyunyan with 3:22 left in the final quarter cut things to 49-41. But Burbank was unable to get any closer. D’Agostin led Burbank with 17 points. Harutyunyan finished with 10 points, and Anglade finished with eight. 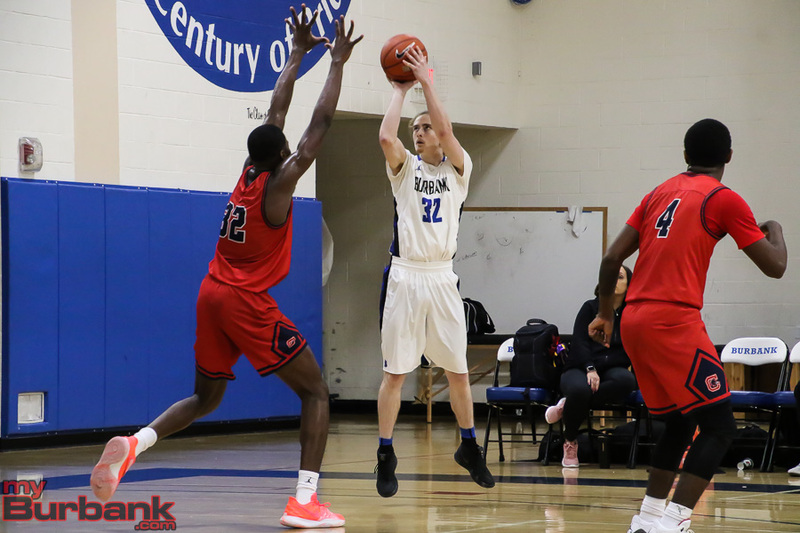 Ben Burnham had four points and Jalen Clark and Guram Dumbadze each had two points. 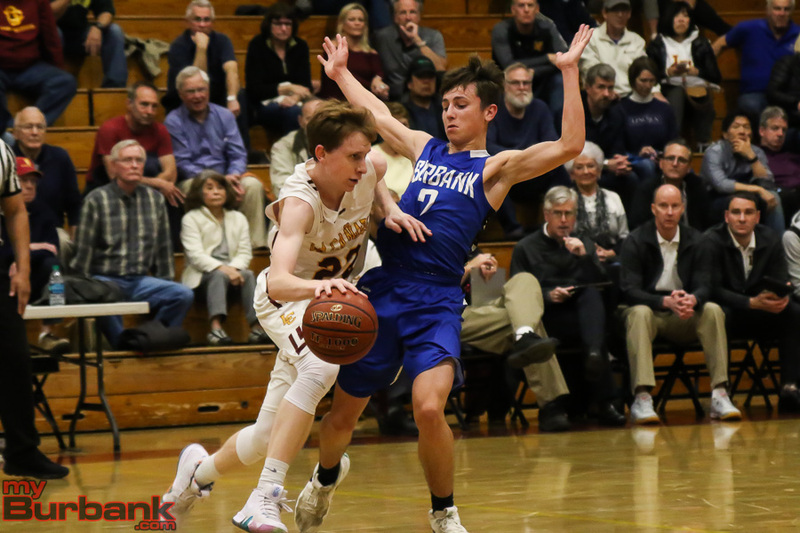 La Canada received 18 points each from Graves and junior Kyle Brown. 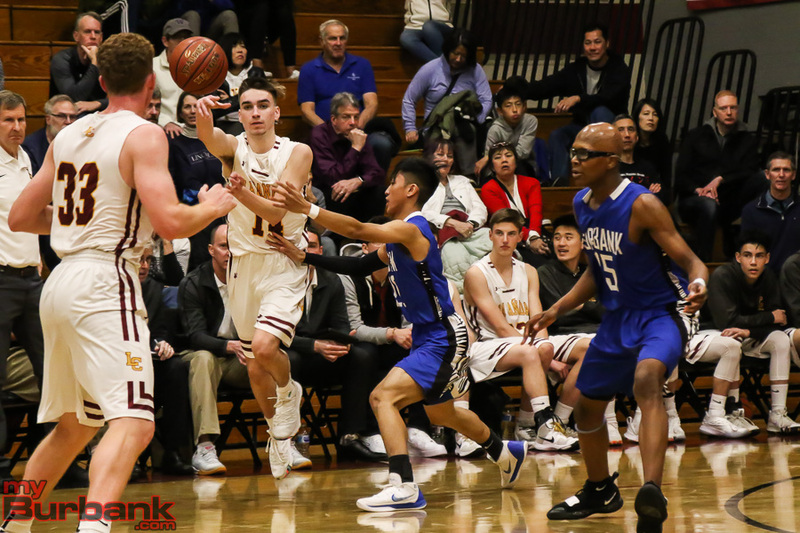 This entry was posted in Boys Basketball, Sports and tagged Ben Burnham, Burbank boys basketball, Erik Harutyunyan, Guram Dumbadze, Isaac Anglade, Jalen Clark, Kyle Brown, La Canada boys basketball, Miles D'Agostin, Ryan Graves on February 9, 2019 by Jim Riggio. 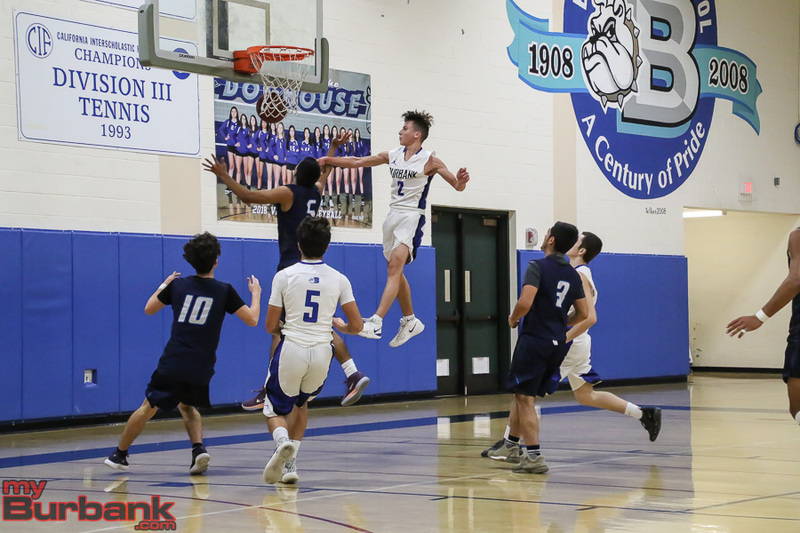 The Burbank High boys’ basketball knew that a win over Burroughs High in the regular season finale would guarantee a CIF Southern Section playoff berth. As a result, the host Bulldogs played focused and determined in an 83-49 contest over the visiting Indians, who won the first meeting between the two rivals. 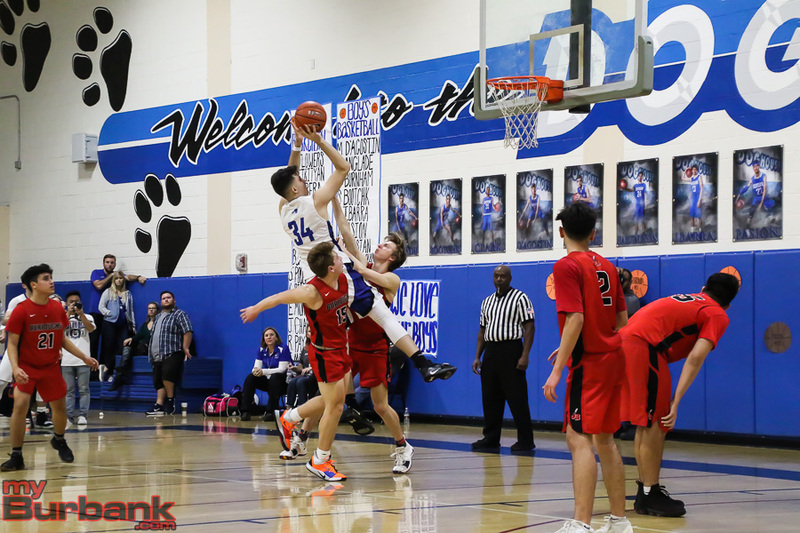 Burbank (17-11 overall, 8-6 in the league) jumped out to a 22-10 lead at the end of the first quarter and were never threatened by the Indians, who finish the season with an 11-16 overall mark, 4-10 in the league. “They were ready to go from the beginning. They wanted revenge and they played well and shot the ball well and we got behind and couldn’t recover,” Burroughs coach Allan Ellis said. Burbank converted 20 of 33 shots it took in the first half and hit five of 14 attempts from three-point range. The Bulldogs led 47-23 at halftime and continued to shine in the third quarter by taking a 66-33 lead going into the final quarter. Miles D’Agostin, who had six 3-pointers, finished with a game-high 22 points. Erik Harutyunyan had 18 points. 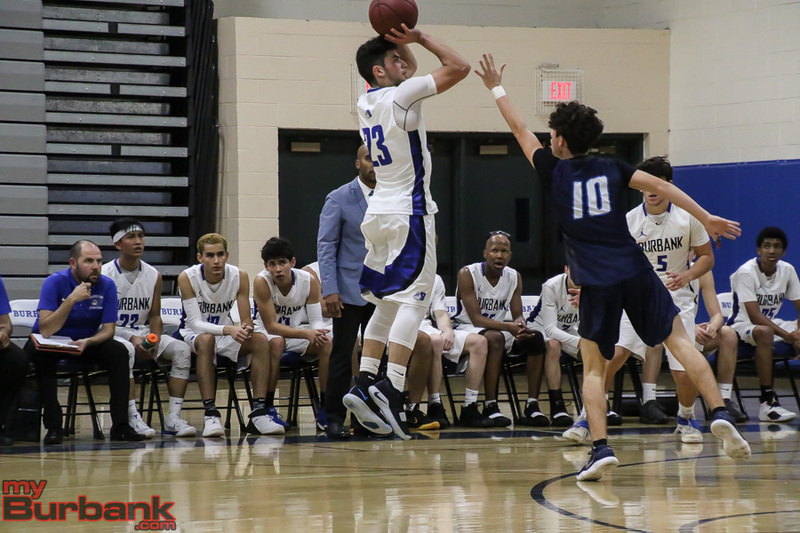 Guram Dumbadze had 12 points, Jalen Clark, Leo Tahmasian and Isaac Anglade each had seven for the Bulldogs. Ben Burnham and Jared Pasion each had three points. Kevin Sarkes and Abiel Pearl each had two points. Burroughs was led by Nick Garcia, who had 14 points. Bryan Oasey had 13 points, Aaron Amanios had nine points and Emery Goulet had four points. Sammy Solis and Evan Zamora each had three points. Carson Cardenaz had two points and Peter Filippi had one point. Baskerville is hopeful the CIF playoff selection committee will look at the Bulldogs’ strength of schedule. “Hopefully we get a good draw if you look at the teams we’ve played. We’ve played Camarillo, Valencia, Calabasas, King-Drew, Crossroads,” he said. 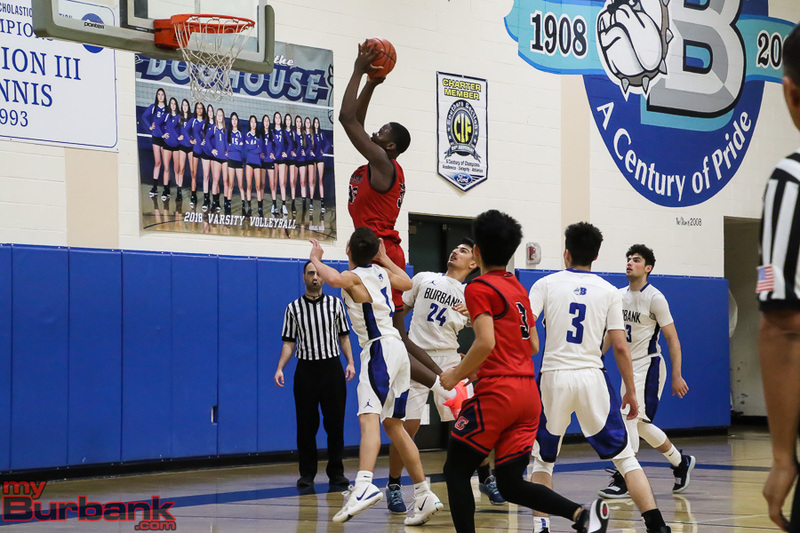 This entry was posted in Boys Basketball, Sports and tagged Aaron Amanios, Abiel Pearl, Ben Burnham, Bryan Oasey, Burbank boys basketball, Burroughs Boys Basketball, Carson Cardenaz, Emery Goulet, Erik Harutyunyan, Evan Zamora, Guram Dumbadze, Isaac Anglade, Jalen Clark, Kevin Sarkes, Leo Tahmasian, Miles D'Agostin, Nick Garcia, Peter Filippi, Sammy Solis on February 1, 2019 by Jim Riggio. After 16 minutes, it seemed that the Burbank High boys’ basketball team had matters in hand. 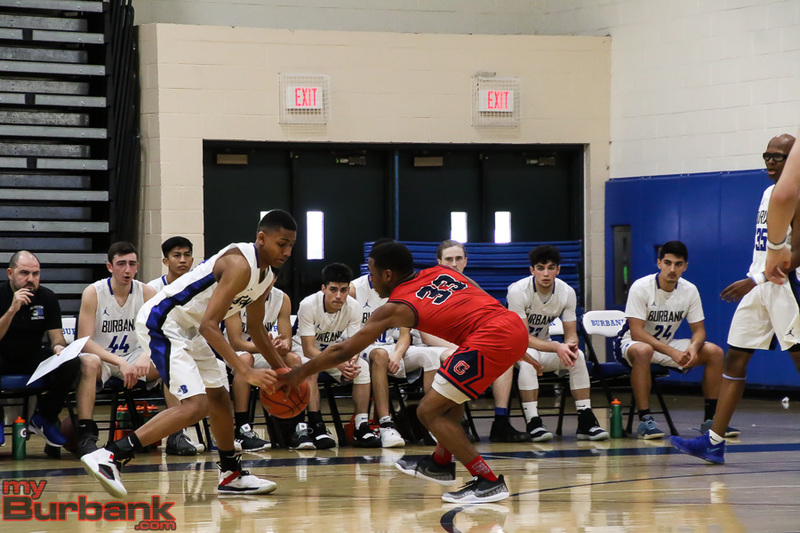 Its long-range jumpers were falling, its man-to-man defense was effective and its passing was crisp, which resulted in the Bulldogs holding a 15-point advantage at halftime over Crossroads in one of seven games held at the Burbank gym for the Dr. Martin Luther King Jr. Day Showdown. What occurred in the second half was the opposite as the Bulldogs struggled offensively, the defense opened up gapping holes for easy hoops including a bevy of slams and too many turnovers as the Roadrunners collected a 73-64 win on Monday afternoon. Burbank (14-10) opened up by making seven of 17 in the first quarter and eight of 17 shots in the second for 44.1 percent and led 43-28. The Bulldogs were successful on six of 23 field goals in the second half (26 percent) and were outscored by 24 points, including 19-6 in the third period. Baskerville continued: “I thought their point guard [Yukki Okubo] did a good job of being more active,” he noted. Burbank senior point guard Miles D’Agostin, who had an off-night in an 18-point loss against visiting Crescenta Valley on Friday, found his stroke versus Crossroads, which produced point guard Baron Davis, who played two seasons at UCLA and 13 in the NBA where he averaged 16.1 points and 7.2 assists. D’Agostin finished with a game-best 27 points, canning five three-pointers. At the break, D’Agostin had 16 points after tallying 13 points in the opening quarter. D’Agostin was held scoreless in the third quarter, but rebounded for 11 points in the fourth frame that included two treys including one with 1:03 left that cut the Roadrunners’ lead to 69-63. 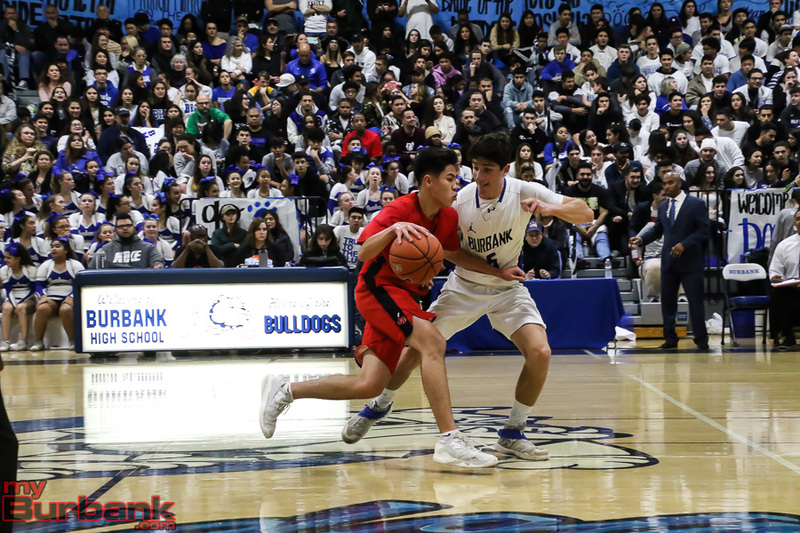 Junior point guard Leo Tahmasian contributed nine points for the Bulldogs (21 of 57 for 36.8 percent) and canned two of Burbank’s 11 three-pointers. The Roadrunners (12-10), who snapped a four-game losing streak, came out slowly in the initial period, making three of 15. Crossroads (43.4 percent on 30 of 69) shot better in the second quarter, hitting six of 14 from the field. Junior swingman Miles Ceballos, whose father Cedric Ceballos, a small forward who toiled 11 seasons in the NBA, including three with the Lakers, poured in nine of his 16 points in the second half. The third quarter saw Adiassa, who had a game-high 27 rebounds, finally break out with six points. 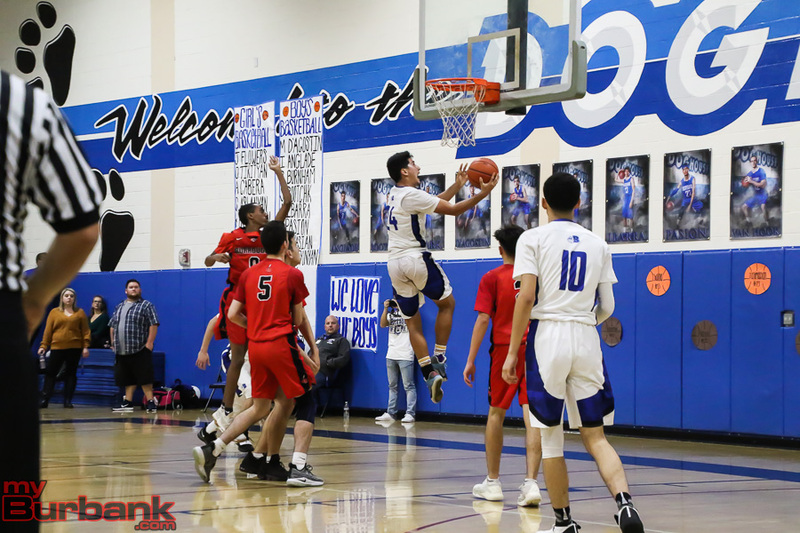 But what followed for Adiassa was a 14-point explosion in the fourth quarter as junior point guard Okubo (16 points) repeatedly found him at the low box and simply lofted easy passes for three vicious and spinetingling slam dunks. Okubo’s scoring output, like the game itself, came slowly at first as he tallied two points in the opening frame and four in the second. Like Adiassa, Okubo took off in the second half as the 5-7 floor leader had four points in the third frame and six in the final period. Junior point guard Mazen Wharton-Ali dropped in eight points for Crossroads, sophomore point guard T.J. Muhammad had six points, while sophomore shooting guard/small forward Shaqir O’Neal, whose father Shaquille O’Neal, a 15-time All-Star, four-time NBA champion and a Hall of Famer, came off the bench and tallied five points. O’Neal’s bucket with 7:20 left on the clock in the fourth quarter handed the Roadrunners a 51-49 edge. 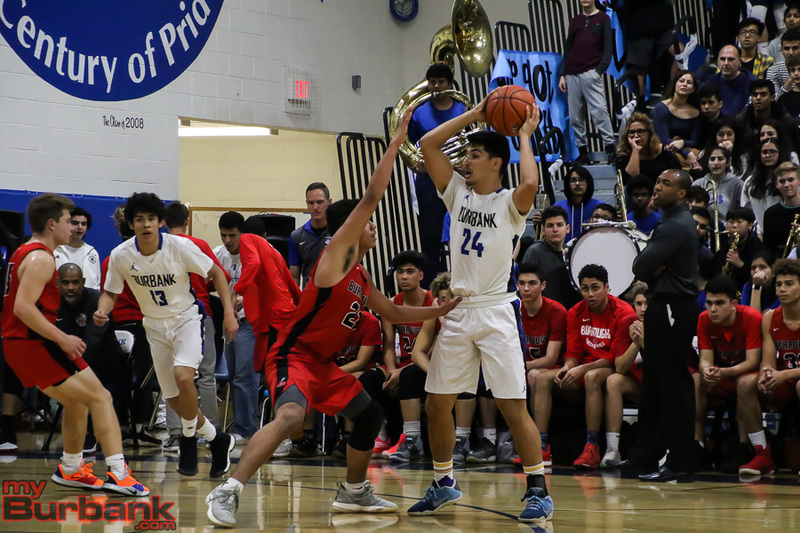 Burbank junior power forward Kevin Sarkes had six points while sophomore point guard Abiel Pearl dropped in five and senior point guard Jared Pasion scored four points. 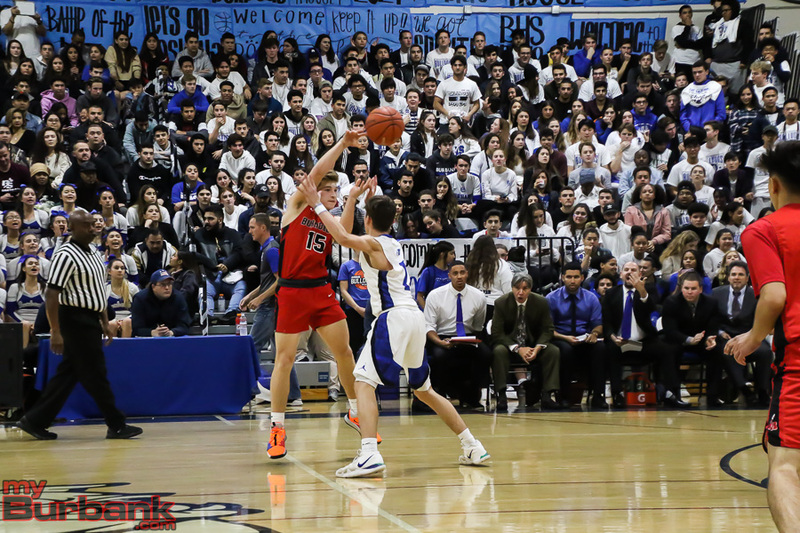 Senior point guard Guram Dumbadze had three points, junior point guard Ben Burnham also had three as did senior shooting guard Chance Van Hook, , while senior point guard Isaac Anglade scored two points as did senior shooting guard Erik Harutyunyan. 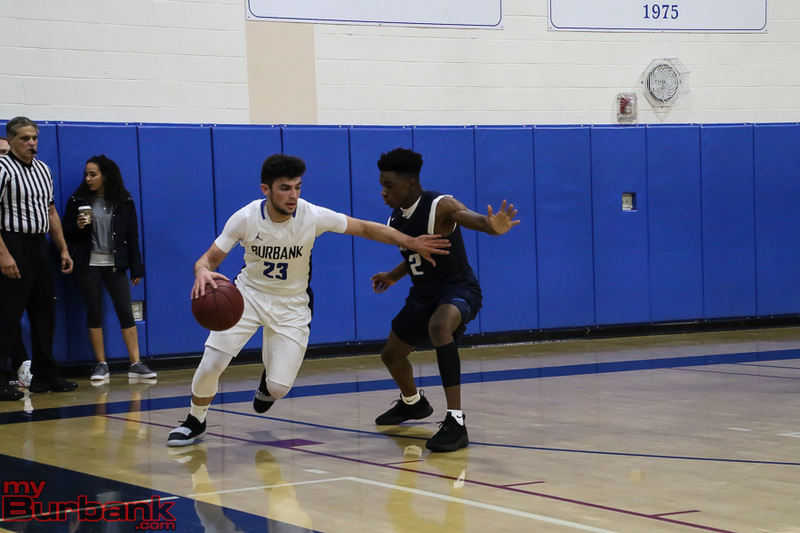 This entry was posted in Boys Basketball, Sports and tagged Abiel Pearl, Ben Burnham, boys basketball, Burbank High, Chance Van Hook, Erik Harutyunyan, Guram Dumbadze, Isaac Anglade, Jared Pasion, Kevin Sarkes, Leo Tahmasian, Miles D'Agostin on January 22, 2019 by Rick Assad. 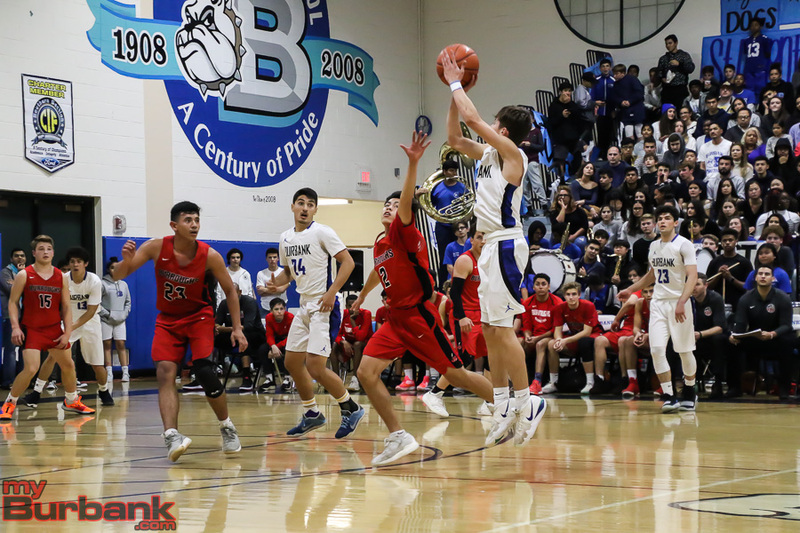 A win is a win no matter how one finds it, and the Burbank High boys’ basketball team will gladly accept it. 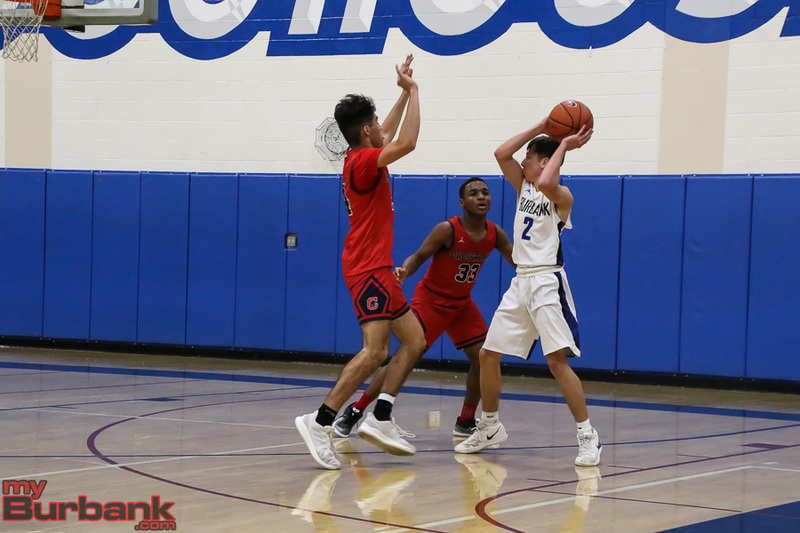 On Friday night, in what may turn out to be a season-changer, the Bulldogs exhibited true grit and determination after leading throughout, and then holding off and escaping with a 74-72 victory over host Crescenta Valley in a Pacific League contest. The Bulldogs shot 49 percent from the floor (26 of 53), but only went to the free-throw line 11 times and converted six. 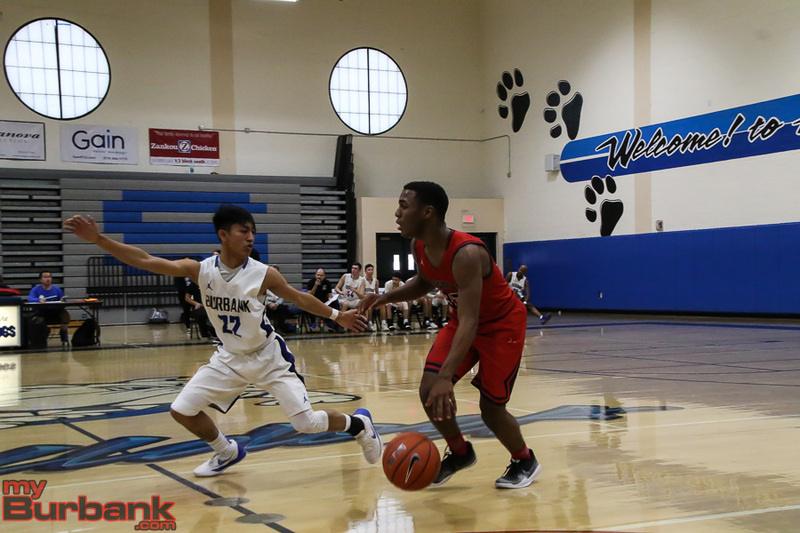 The key statistic was Burbank (6-4 and 2-2 in league) knocked down 14 three pointers. The Falcons (10-2 and 2-2 in league) hit four. Crescenta Valley did make 20 of 23 (86.9 percent) from the charity line and changed its philosophy in the second half when it went strong to the hoop rather than settle for outside jumpers like it did in the opening half. Senior Miles D’Agostin and junior Leo Tahmasian each scored 19 points for the Bulldogs, who had 11 treys at the half when they built a 47-28 lead. 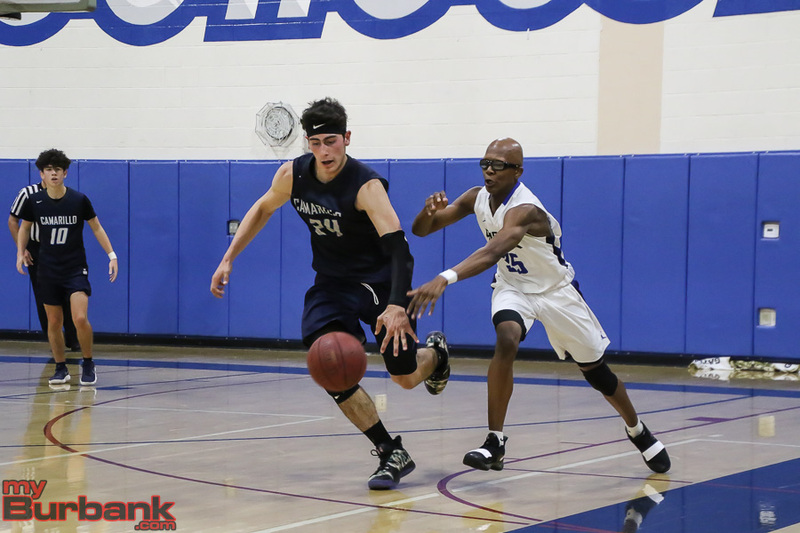 Leading the Crescenta Valley’s offensive was junior Tyler Carlson, who dropped in 16 points and it was Carlson’s three-pointer at the buzzer that fell short of the mark. 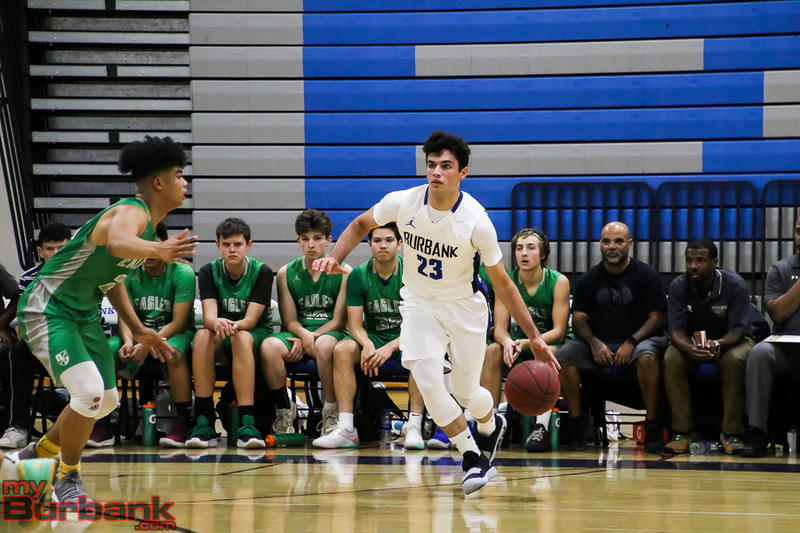 Burbank established a 20-10 advantage heading into the second quarter as D’Agostin made three treys while Tahmasian scored four points. 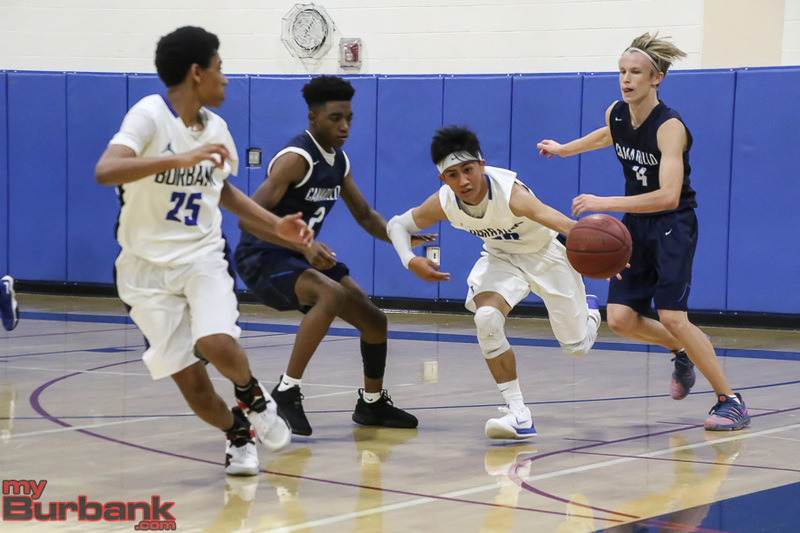 The Bulldogs went wild in the second quarter, nailing seven three-pointers with senior Jalen Clark (14 points) dropping in two and Tahmasian talling eight points, including two from three-point range. Burbank shot 56.6 percent from the field at the half, making 17 of 30, while the Falcons drilled nine of 30 (30 percent) from the field and eight of nine charity tosses. D’Agostin chipped in with 14 points at the intermission, Tahmasian had 12 points and Clark scored eight points. 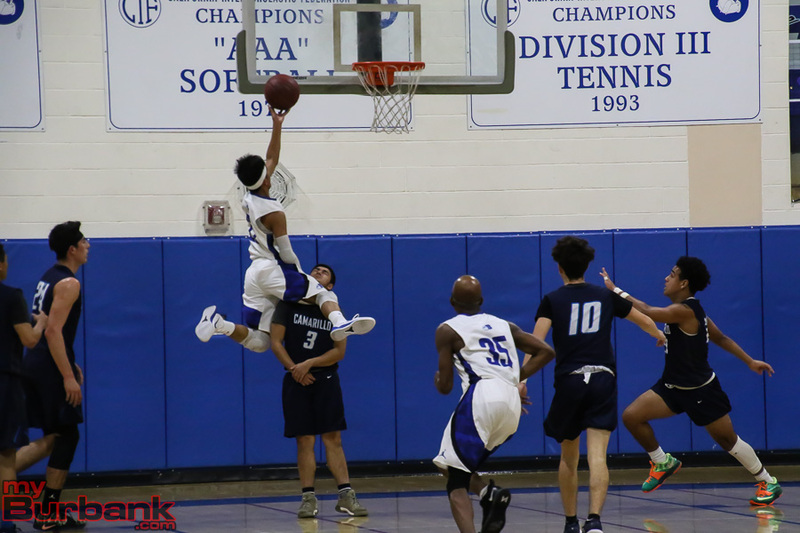 Crescenta Valley, which shot 37.5 percent (24 of 64) from the field outscored Burbank 18-13 in the third period with Carlson scoring six points as the Falcons fell behind 60-46 . The Falcons, who shot 44.1 percent in the second half (15 of 34 ) erupted for 26 points in the fourth quarter while the Bulldogs scored 14 points with D’Agostin and Tahmasian each dropping in five points. 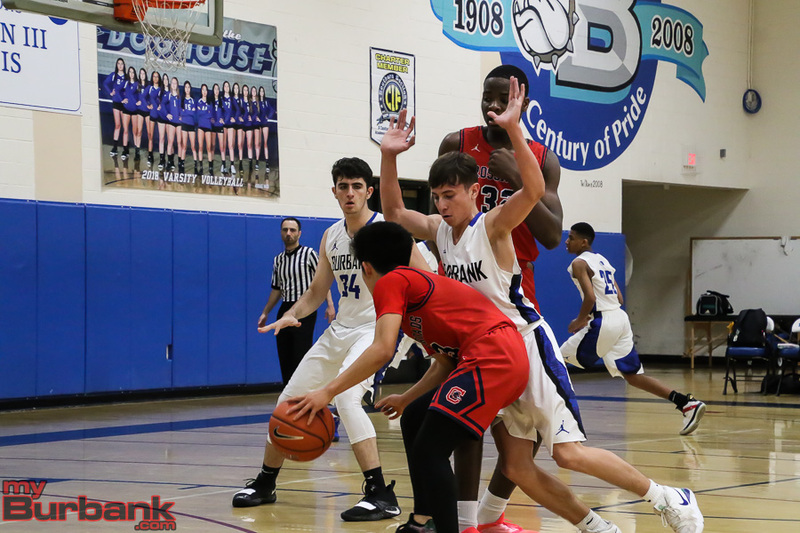 Burbank junior Ben Burnham tallied eight points, sophomore Abiel Pearl accounted for seven, senior Guram Dumbadze added three points and senior Isaac Anglade accounted for two. 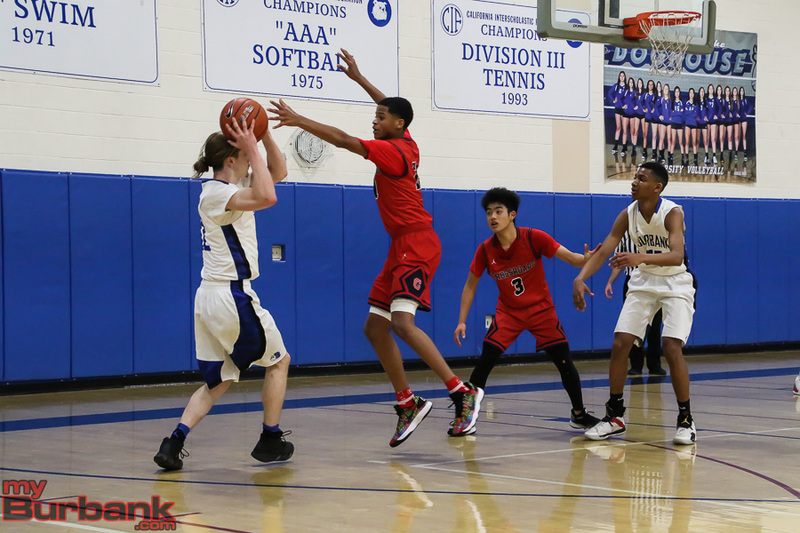 This entry was posted in Boys Basketball, Sports and tagged Abiel Pearl, Ben Burnham, Burbank High, Guram Dumbadze, Isaac Anglade, Jalen Clark, Leo Tahmasian, Miles D'Agostin, Pacific League on December 15, 2018 by Rick Assad. Miles D’Agostin had an evening he’s going to remember for a very long time after pouring in a game-high 36 points. 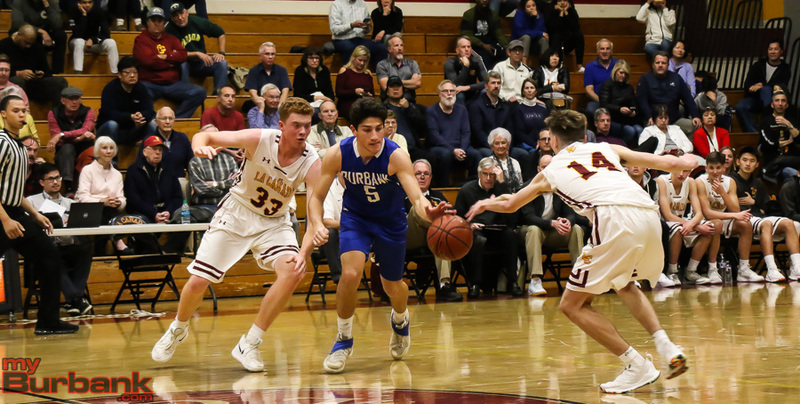 D’Agostin is a senior shooting guard who practically carried the offensive load, helping push the Burbank High boys’ basketball team to a convincing 78-62 rout of visiting Arcadia in the Pacific League opener on Tuesday night. D’Agostin accounted for 21 points in the opening half and finished with eight three-pointers and drilled six of six from the free-throw stripe. 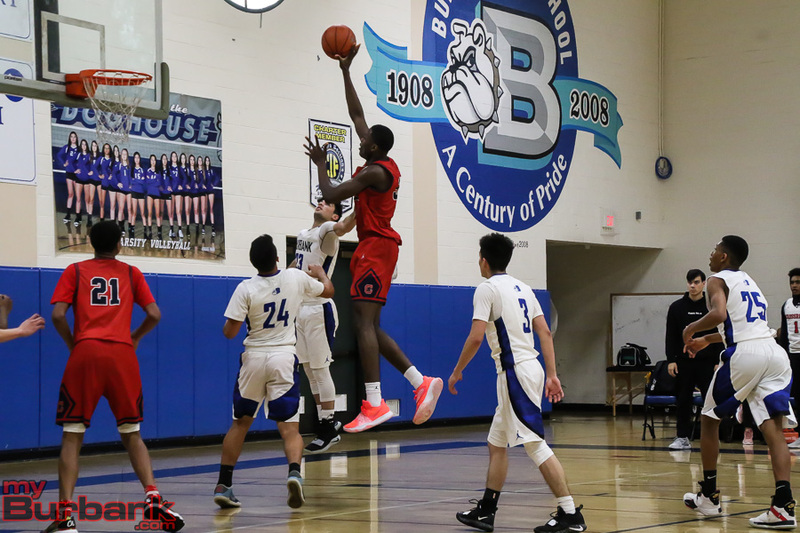 The next high scorer for the Bulldogs, who canned 11 from three-point range, was senior shooting guard/point guard Isaac Anglade’s 10 points as he pumped in two from beyond the three-point arc. 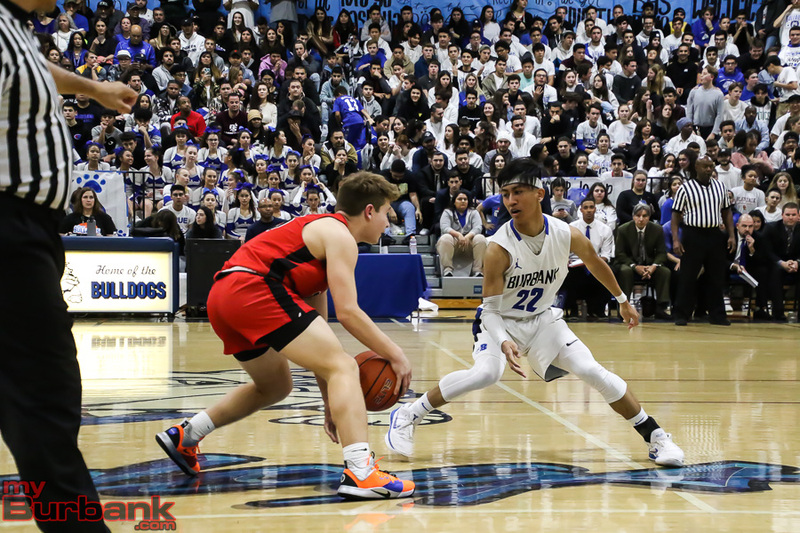 The key quarter for Burbank (5-2 and 1-0 in league) was the third when it exploded for 22 points and took command 60-44 after making nine of 16 (56.2 percent) from the field and two of two from the free-throw line. Meanwhile the Apaches (5-2 and 0-1 in league) converted five of 15 (33.3 percent) from the floor in the third period after missing their first two attempts. Wallace added: “When we don’t score and we’re not playing physical and we’re not playing fast, that’s what ends up happening,” he said. D’Agostin’s long trey with 4:46 showing in the third period saw the Bulldogs take command 50-36. The opening quarter was close as the Bulldogs moved in front 19-18 heading into the second period. D’Agostin led the way as he tallied eight points with six coming by way of three-pointers in the initial period. The Bulldogs didn’t shoot well in the opening half, making nine of 29 (31 percent) from the field, but canned 13 of 20 (65 percent) from the free-throw line. On the night, the Bulldogs converted 17 of 26 from the free-throw line for 65.3 percent, which could be better according to Baskerville. 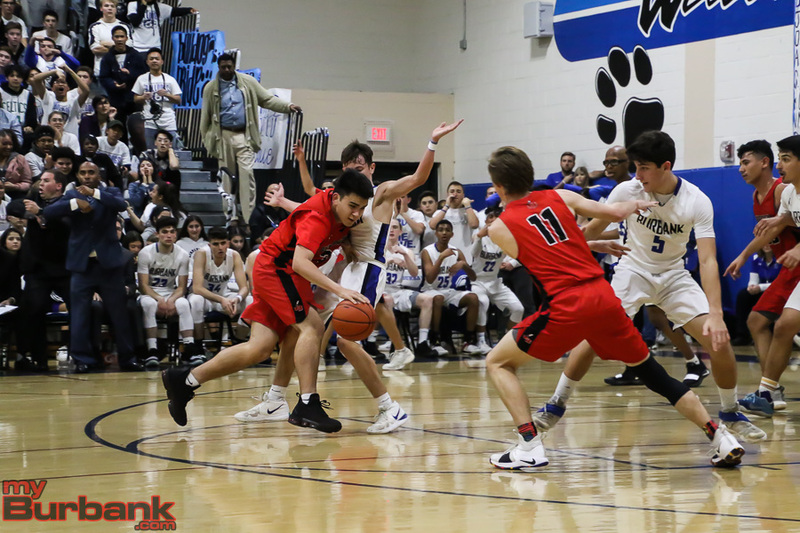 In the second quarter, D’Agostin scored 13 points, including three via three-pointers as Burbank moved in front 38-32. When D’Agostin hammered a three-pointer with 1:32 left in the second quarter, the Bulldogs, who shot 40.3 percent on 25 of 62 from the floor, bolted ahead 32-30. 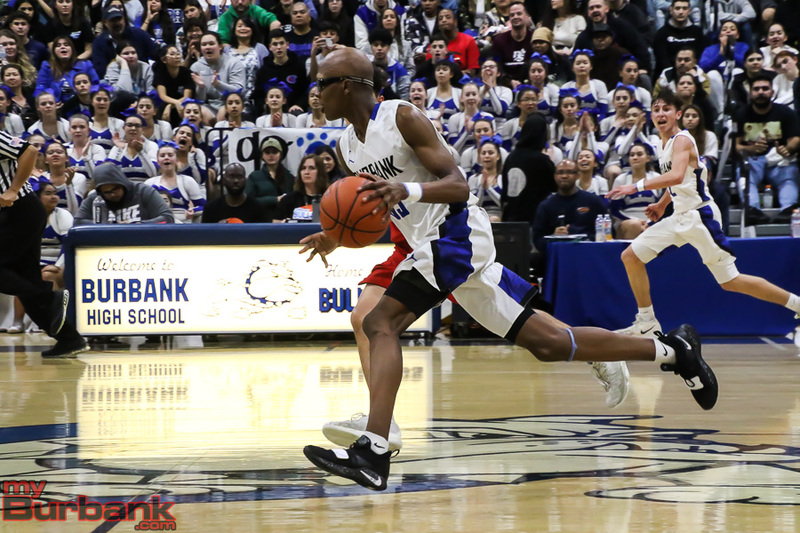 Burbank was off in the fourth quarter, sinking seven of 17 (41.1 percent) and two of four from the charity line. D’Agostin had a quiet fourth quarter scoring five points, while the leader was Anglade with seven points. Junior shooting guard Richard He led the Apaches (5-2 and 0-1 in league) with 13 points after drilling two three-pointers. 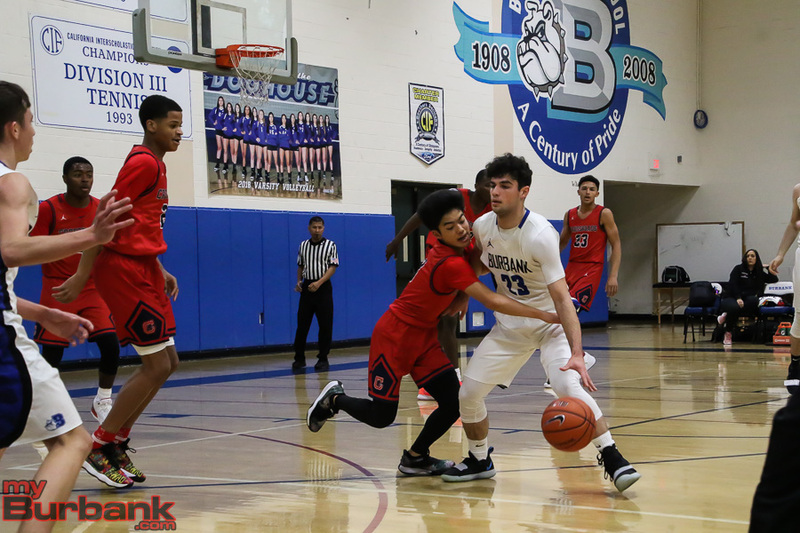 Senior small forward Erik Harutyunyan tossed in nine points for Burbank, while sophomore small forward Abiel Pearl added five points and senior small forward Jalen Clark collected four points. Senior point guard Kenneth Lee and senior shooting guard Sean Liu each scored eight points for the Apaches, who shot 25 percent from the floor (14 of 56) and eight of 21 from the free-throw line (38 percent). 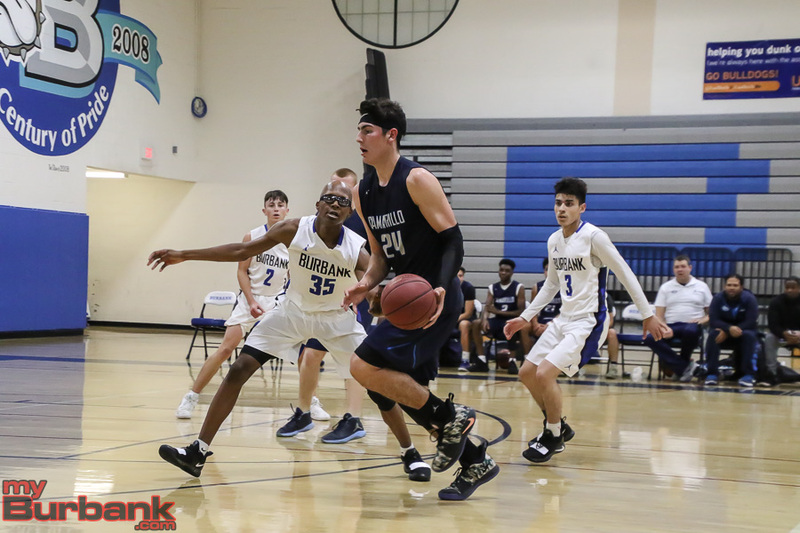 This entry was posted in Boys Basketball, Sports and tagged Abiel Pearl, boys basketball, Burbank High, Erik Harutyunyan, Isaac Anglade, Jalen Clark, Miles D'Agostin, Pacific League on December 5, 2018 by Rick Assad. 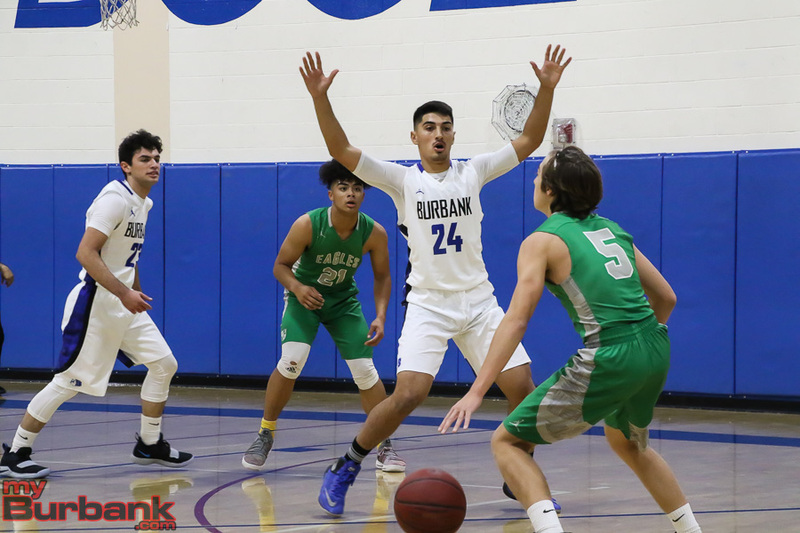 The Burbank High boys’ basketball team knew beating visiting Camarillo High would not be easy in the semifinals of the Burbank Tournament Friday. 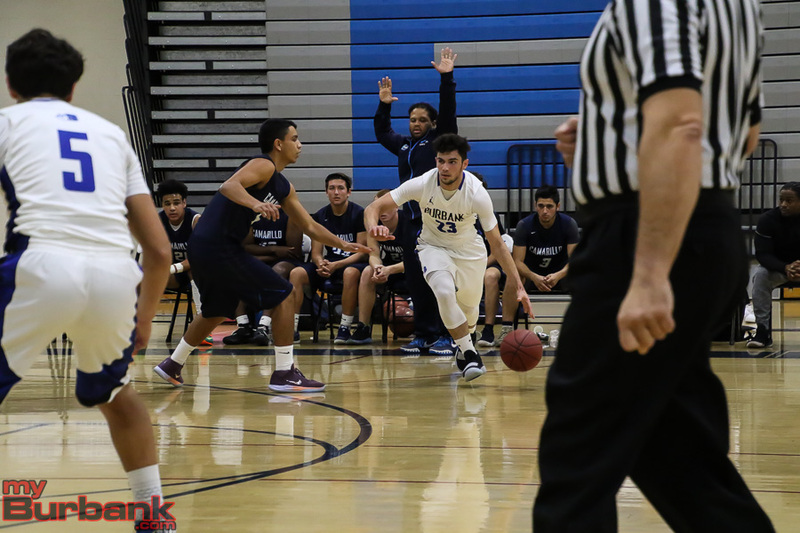 Sure enough, Camarillo was as good as advertised in an 85-68 victory. But the Bulldogs left coach Ernest Baskerville happy with the team’s effort. 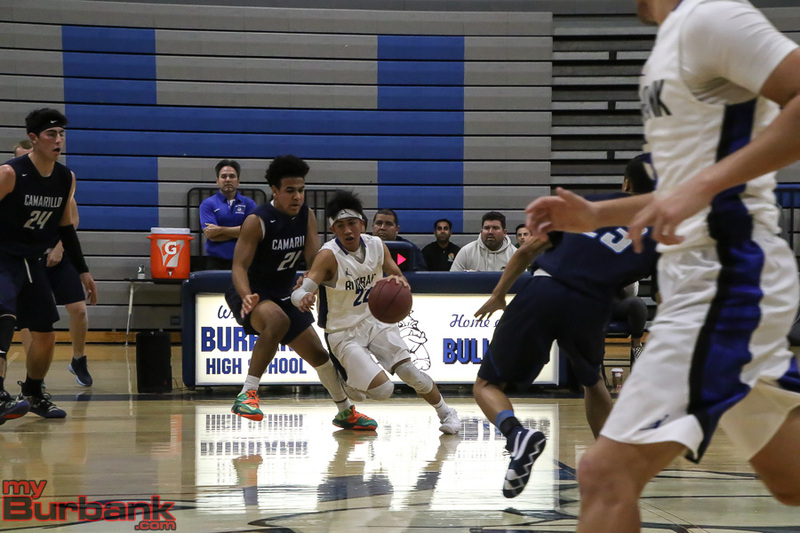 Camarillo (6-0) pressed all over the court and forced Burbank into 18 turnovers. Camarillo’s 6-foot-6 UCLA-bound star Jaime Jaquez Jr. scored 29 points. It was just the second time Jaquez scored less than 30 points through the first six games of the season. “We all play together and we all know the ultimate goal is to win and we buy into that,” Jaquez said of his team. Burbank (4-1) never led in the contest. Camarillo led 17-12 at the end of the first quarter and extended the lead to 42-24 at halftime. 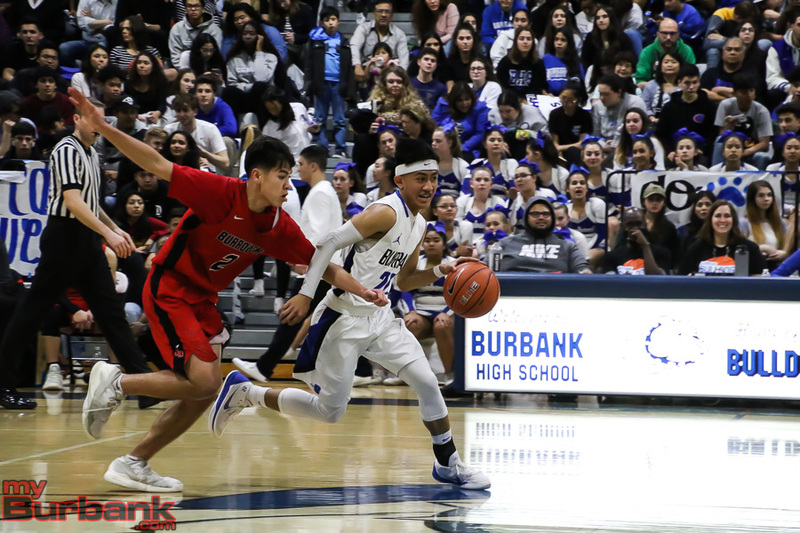 Burbank trailed 68-38 at the end of three quarters, before battling back in the final quarter. Miles D’Agostin led Burbank, as he finished with 24 points and hit four three-pointers. Teammate Abiel Pearl finished with 12 points, scoring all on three-point shots. Leo Tahmasian also hit a pair of three-pointers to finish with six points. Erik Harutyunyan, who got in foul trouble early, finished with 13 points, all of which were scored in the second half. 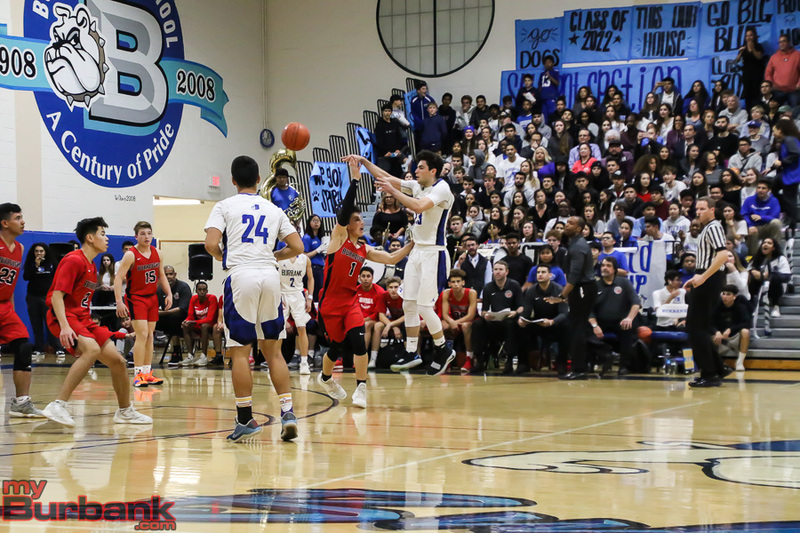 Burbank trailed by as much as 33 points in the fourth quarter before fighting back to cut the deficit to as little as 82-67 with 1:15 left, when Pearl hit a three-pointer. Jared Pasion had five points. Isaac Anglade, Clarence Tahmasian and Angel Ibarra each had two points. Ben Burnham and Satchel Bootchk each hit a free throw. 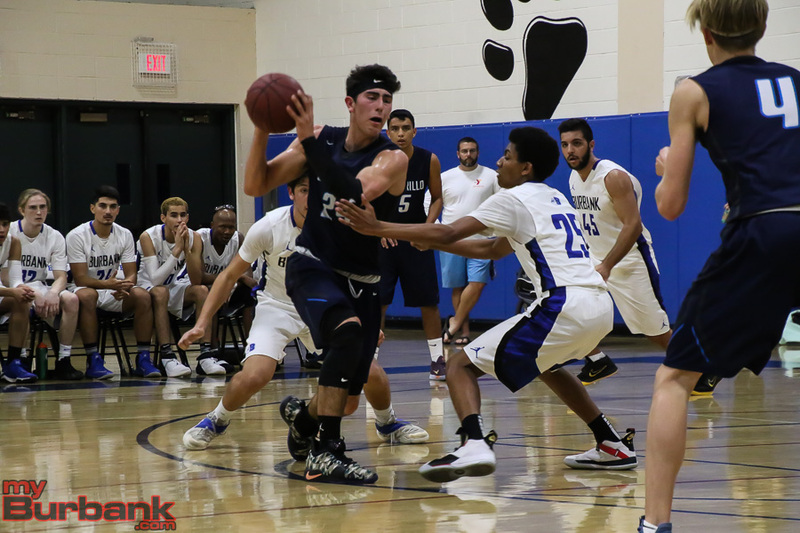 This entry was posted in Boys Basketball, Sports and tagged Abiel Pearl, Angel Ibarra, Ben Burnham, Burbank boys basketball, Clarence Tahmasian, Erik Harutyunyan, Isaac Anglade, Jared Pasion, Miles D'Agostin, Satchel Bootchk on December 1, 2018 by Jim Riggio.